Newly-discovered details about plans for Carlton Avenue bridge confirm that the demolition and reconstruction not only will take longer than the officially announced two years, it will take at least three years and likely much longer. The bridge, which connects Pacific Street to Atlantic Avenue and thus Prospect Heights to Fort Greene, closed in January 2008. In January of this year, the Department of Transportation (DOT) said the work "is scheduled for completion January 2010." Now DOT has quietly advanced the official opening date (above) to January 2011--three years after closure. But there's ample reason to believe that the reopening would be delayed even more, possibly until mid-2012, as I explain below. Notably Forest City Ratner is proceeding in three stages, a far slower sequence than that disclosed in the Final Environmental Impact Statement (FEIS). On Sunday, I contacted two DOT spokesmen for an update, but have not gotten a response. 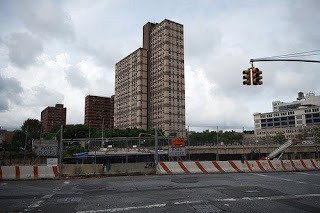 In Chapter 17, Construction Impacts, of the FEIS prepared by the Empire State Development Corporation (ESDC), there was no reference to such phasing. Rather, the bridge was presumed to be fully demolished and reconstructed within two years, during the construction of the temporary yard. The first step in the reconstruction of the Vanderbilt Yard would be to build a temporary yard in Blocks 1120 and 1121. Existing tracks and other structures in the area of the temporary yard would be removed. Then a temporary trestle from the main line would be built to allow train access. The Carlton Avenue Bridge and its foundations would be demolished and rebuilt. Some temporary electrical switchgear and other operating equipment would be installed. A temporary ramp along the north edge of Pacific Street would be constructed to allow access. Finally, the new temporary tracks would be installed, and the existing yard closed. This phase of the work is expected to take about two years. How long will it take take? Stage 1 began in January 2008. How long will it last? 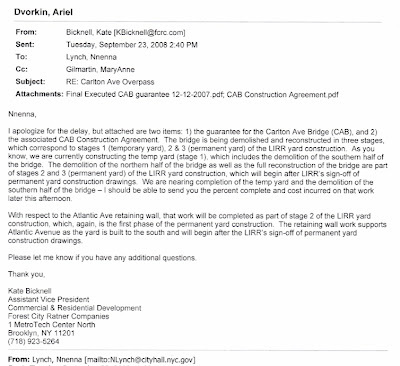 At least until the Long Island Rail Road signs off on permanent yard construction drawings. 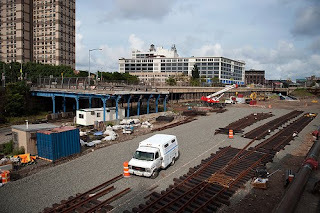 And such documents need not be completed until June 2011, according to a Staff Summary prepared by the Metropolitan Transportation Authority in June regarding the revised deal for the Vanderbilt Yard. That's three-and-a-half years after the bridge was closed. But the reconstruction job wouldn't be done by then. The demolition of the northern half of the bridge as well as the full reconstruction of the bridge might not begin until June 2011. According to the Staff Summary, construction of the upgraded permanent yard must begin by June 30, 2012, with a fully operational Upgraded Yard in place by September 1, 2016. Remember, the FEIS estimated that the closure and reconstruction of the bridge would take two years, and an ESDC Memorandum of Law (left) prepared for the case challenging the environmental review cited that two-year estimate. Demolition of the northern half of the bridge and the full reconstruction of the bridge are part of what Forest City described as stages 2 and 3, which may not begin until June 2011. That could mean the Carlton Avenue Bridge wouldn't reopen until June 2012--four-and-a-half years after closure and shortly before the 2012-13 basketball season. I've long stated that a 2012 arena opening is the best-case scenario, even though Forest City Ratner and Nets representatives still claim 2011. Both the Carlton Avenue and the 6th Avenue bridges are anticipated to be open when the Arena opens. Note that revised plans announced this June by the ESDC do not require demolition of the 6th Avenue Bridge. While Forest City Ratner has three years to complete the job without penalty, a clause in the contract, signed 12/17/07, provides up to five years to complete the work in case of Unavoidable Delay. One definition of Unavoidable Delay is a delay in "completing the Master Closing," which includes the ESDC's exercise of eminent domain and the closing of a purchase and sale agreement with the MTA/LIRR for the Vanderbilt Yard. Neither has been achieved, though the latter has been negotiated. So Forest City Ratner is claiming Unavoidable Delay, as DOT officials said in June, and it's likely the developer will try to take much of the five years the contract may allow. DOT officials in June seemed concerned that the developer would try to stretch the deadline. Now, it seems, there's additional reason for concern.